Could motorists avoid fines via a legal loophole? Barrie Segal runs his own parking campaign, and for a fee will help you appeal against your parking ticket. 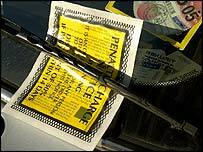 Barry Segal claimed that motorists have lost confidence in the system of parking tickets. He's found what he says is a legal error by parking ticket companies - some of whom are not putting the date of issue on their parking tickets. Barrie claims that this makes the tickets invalid (as customers need a date of issue to know when the 14 day period for paying the ticket begins). You can find out more on Barrie's website - AppealNow.Com from the link on the right-hand side of the page. But Nick Lester said that the appeals system showed that there was enough redress for any motorist who feels unfairly treated. You can access the adjudicators' websites from the links on this page.